Home » Most Popular » 50" to 60" » Felton 54"
Transitional, Tommy Bahama style Felton bath vanity is simple and sleek in a class by itself. 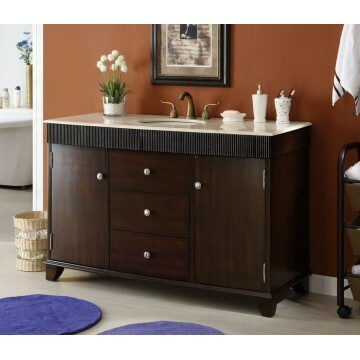 This cabinet is built with solid durable wood with birch wood veneer finish and a semi gloss espresso finish. Natural cream marble counter and bisque undermount porcelain basin. All three front drawers are functional, side compartment with half shelves provide ample storage space for towels.